Gun Violence Should Be Treated As A Public Health Crisis, Study Says : The Two-Way The U.S. "has the highest rate of gun-related deaths among industrialized countries, with more than 30,000 fatalities annually," the study says. Yet funding for gun violence research is limited. 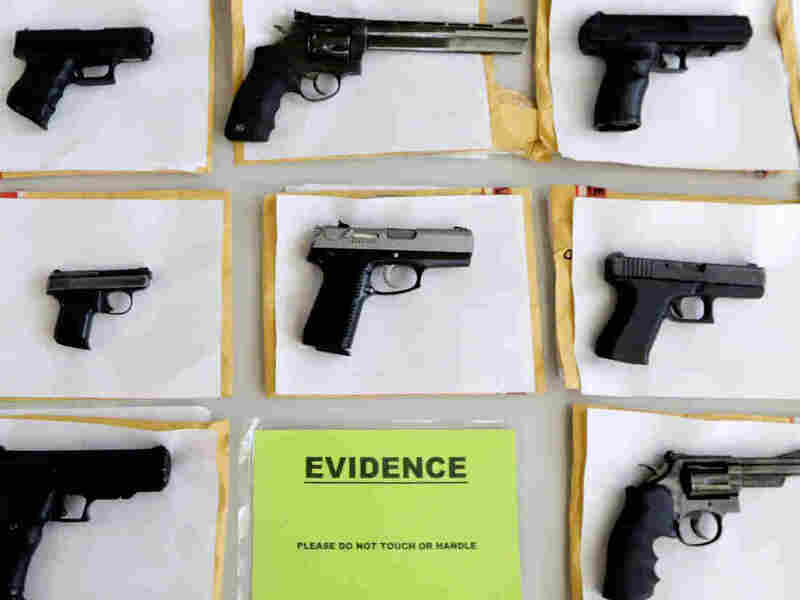 Some of the thousands of illegal firearms Chicago police confiscated in 2014. Researchers evaluated the leading causes of death in the U.S. and plotted them against the funding and publication of research dedicated to to them. "Gun violence had 1.6% of the funding predicted ($1.4 billion predicted, $22 million observed) and had 4.5% of the volume of publications predicted (38,897 predicted, 1738 observed) from the regression analyses. Gun violence killed about as many individuals as sepsis. 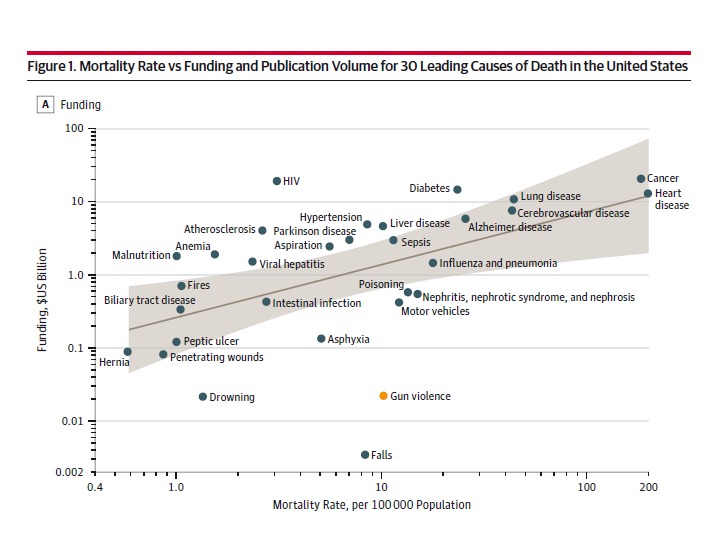 However, funding for gun violence research was about 0.7% of that for sepsis and publication volume about 4%. In relation to mortality rates, gun violence research was the least-researched cause of death and the second-least funded cause of death after falls." NPR's Cheryl Corley reports that in a different study published Tuesday by JAMA Internal Medicine, researchers studied gun violence in Chicago over an eight-year period to explain how it can spread like an infectious disease." She said medical advocates have long argued that gun violence is a public health crisis, and that the researchers say their study helps prove this point. "Yale University sociologist Andrew Papachristos said researchers treated the idea of gun violence literally and created a network from more than 100,000 individuals at risk of getting shot.
" 'These gunshot victims — they're in very small social networks. They tend to cluster together in these networks. And really what our study shows is that gun violence cascades over time,' Papachristos said." Papachristos said the study in JAMA Internal Medicine helps show there must be a more coordinated approach to drive gun violence down, one that treats it as a public health epidemic and not just a policing problem. The research published in JAMA offers an explanation for the lack of funding: A 1996 congressional appropriations bill that banned funding from the Centers for Disease Control and Prevention to be used to "advocate or promote gun control." The authors of the study note that "similar restrictions were subsequently extended to other agencies (including the National Institutes of Health), and although the legislation does not ban gun-related research outright, it has been described as casting a pall over the research community." Research, though, has proved an effective tool in driving down mortality rates from other leading causes of death. "I think a good parallel can be drawn to motor vehicle accidents. Those kill about the same number of people, but that has been decreasing substantially. ... All of that really starts from essential public research that determines the proximate causes of accidents — and it's only with research that you can start to develop plans and policies and initiatives." The text and a photo caption on a previous version of this post referenced a study on gun violence in Chicago that was published by JAMA Internal Medicine, not the Journal of the American Medical Association.